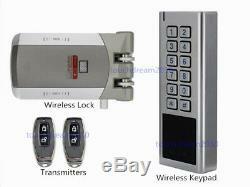 Upgraded Wireless Door Access Control System Anti-theft Lock with 433MHz Rolling Code Technology +Metal Keypad +Remote Control. If you want to check the hardware manual/software manual/SDK or the. If you have any question, ask me freely and I will respond you within 12 hours. We only do quality product and service, because this is for security system. Welcome your question, any question is good question. 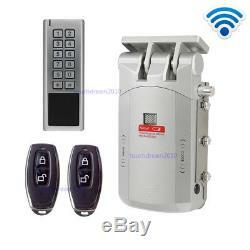 This is Wireless Electric Security Door Lock Kits, Very Easy to install. For Entry, use password(500 users capacity) or RFID Key Fob or Remote control; For Exit, Press Exit buttn or Open Key. 1 x Metal design & Waterproof Keypad(can install outside, no include battery). 10 x RFID Key Fobs(Key chains). 1 x 3M Glue Kit For Installing. 1 x Rivet Screw kit. 1 x Self Tapping Screw Kit. 1 x English User Manual. 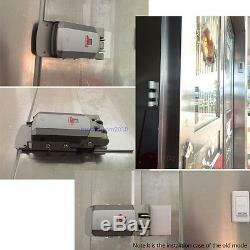 Very easy to install, No Cable, No Wire, If use our provided 3M Sticker plate, no need Drill. Suitable for Wood door and Metal door. 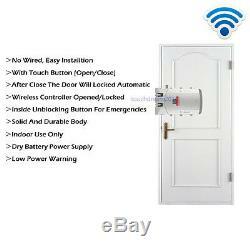 Suitable for Singld door or Double Door(One side door must be fixed). This Lock system has high security level. Remote communication Adopt the latest 433M Scroll code Technology. Remote controller send 60-bit length code each time and will become invalid after using one time, it's very diffcult to be hacked. In case if you lost the remote controller, just renew the code again, the lost controller will become invalid. Without hole design, Open or close the lock with a remote control or RFID keypad, completely safe and security. Easy installation on all kind of doors: wood, metal, glass, etc. Internal unblocking system for emergencies. 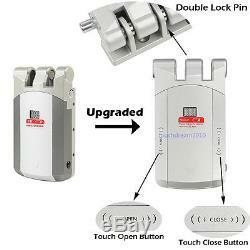 Touch Design: it can be locked and unlocked by touching the lock body when indoors. Power supply: 2 x 1.5V AA Alkaline Batteries. 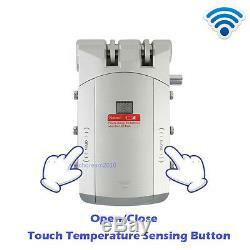 Built in 433MHZ wireless transmitter, support wireless RFID keypad (Max 500 users). When the battery is low, the LED light flickers, buzzer alarm, means that charge is necessary. 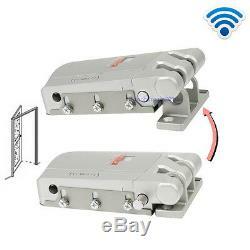 Remote control maximum Effective Range up to 10m(without obstacles). Indoor can manual switch lock function. 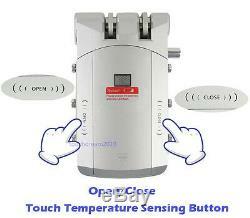 When the battery is under voltage 1.9V, the lock will open automatically. 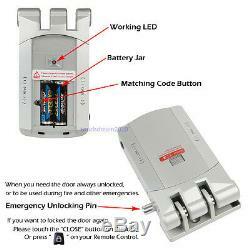 Link many electronic door locks with the same remote control. Reallocation coding function:If you lost the remote control. Just use a new remote control to set the code with lock. The lost one will be invalid. A body casting:Structure of the tiger button, lock body using zinc alloy casting, pry proof performance is outstanding, more safe and reliable. Emergency Release Button:In an emergency, only need to press the emergency open button, lock will open automatically, facilitate emergency escape, ensure the safety of life. RFID password keypad: support ID keyfob/card, max 500 users. Power Supply: 2 common AA batteries. No cable, no need drilling. 3M tape for easy install. The whole kit can also use 3M sticker for installation, no need drill holes, makes installation very easy and quick, anyone can install the whole system themselves. Wiegand 2637 bits input & output. User data can be transferred by Wiegand line. Access modes: Card, PIN, Card + PIN, Multi Cards/PINs. 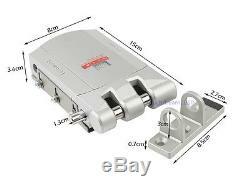 Card type: 125KHz EM card, PIN length: 46 digits. These are 125KHz RFID Proximity Keyfobs / ID cards, they can work with the product which has 125Khz RFID card reader. Each comes with Key ring included. Compatible with all RFID ID card reader to gain access. Each token pre-programmed with unique ID which is printed on it. Our products exported accross all over the world for more than 8 years. We have strong and professional experience on hardware, software, SDK and related tools. More importantly, we have passion and patience, we will. Support you until answering your question, bringing value to you, your company and your customer. We ensure our product quality, All our products are strictly tested before sending out. We will try our best to help you. We will give you all five star feedback. If you have any question, ask me freely and I will respond you with 12 hours. The item "No Cable No Need Drilling Easy To Install Wireless Anti-vandal Lock Kit & Keypad" is in sale since Thursday, November 2, 2017. This item is in the category "Business & Industrial\Facility Maintenance & Safety\Access Control Equipment\Locks\Other Locks". The seller is "touchdream2010" and is located in HongKong. This item can be shipped worldwide. Working Distance: Within 5m indoor, within 0.5-1m outdoor.